David Anderson and Tamara Romanchuk, Co-Artistic Directors of Clay & Paper Theatre, understand how the arts can transcend adversity and empower people to change their communities for the better. In our turbulent modern world where we are flooded with too many social, environmental and political challenges to count, it can become easy to lose our sense of community. How can we feel empowered to tackle local and global issues when we’ve become so overwhelmed and disconnected to the world around us? The answer to this question is perhaps simpler than one might think: art. Clay & Paper Theatre, a community-driven family-friendly theatre company currently in its 24th season, creates original theatrical works that challenge the status quo and encourage discussions about community: “The work of Clay & Paper has in a deeper sense been about citizenship, and what it means to be a citizen.” said David Anderson, Founder and Co-Artistic Director, “And to be a citizen means to be someone responsible for the state of the world around you and the people around you.” While Clay & Paper Theatre hosts several events throughout the season, including the Night of Dread community parade and performances in October, and a new 8-week Open Studio program at Amos Waites Park in July and August of this year, the Day of Delight kicked off the summer as part of Arts in the Parks. 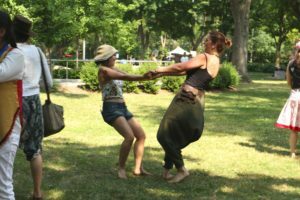 On Sunday June 17th 2018, I attended the 15th annual Day of Delight, a one-day multidisciplinary festival set amongst the lush green landscape of Dufferin Grove Park. The event featured a diverse lineup of colourful and unconventional performances of dance, music, theatre and more. Among the activities, audience members enjoyed a performance from artist Jesse Wabegijig who played a heartbroken but hopeful clown, and music from Matti Palonen and Pedro Bonatto de Castro who played a colourful tree harp and a tree drum. As many of us know, a goal of all art is to provide a transformative experience that not only makes us aware of something cognitively, but also helps us feel it emotionally and physically. This idea of “feeling art” was so apparent to me at Day of Delight, because I felt the community and inclusivity of each individual performance. For example, one performer named Claudia Edwards introduced audience members to a balloon-man named ‘Norman Heterotivity’. Each of Norman’s balloons represented a cultural assumption about gender and sexuality, and viewers were invited to help pop these ideas. While children gladly stepped up to burst the balloons, adults cheered and clapped along as each idea was read aloud and then popped and dismantled – it really felt like a group effort. 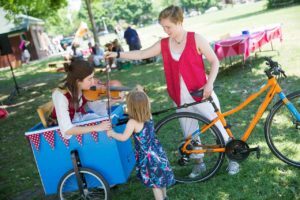 Making the arts accessible to all types of people, regardless of ability, age, ethnicity and so on, is not only a mandate of the Arts in the Parks program, but it is one of the primary objectives of Clay & Paper Theatre: “We work in a park, and everybody is here. So who is the audience? Everybody,” said David. Activism via audience participation was also built into many of the performances of Day of Delight. For example, an act from Shannon Hancocks and Lisa Hearn encouraged audience members to make sound effects with their hands and mouths for their short performance about a Mermaid and a Phoenix who became unlikely friends. Or, a musical performance from an a cappella group called ‘Broulala’ relied on the audience to help create and hold the tempo for the songs they performed. This kind of transformative public experience, which takes audience members from passive viewers to active engaged participants, is what made the Clay & Paper experience so unique for me, as it reaffirmed the message that everyone can be an active participant, in the arts, in our communities and beyond. 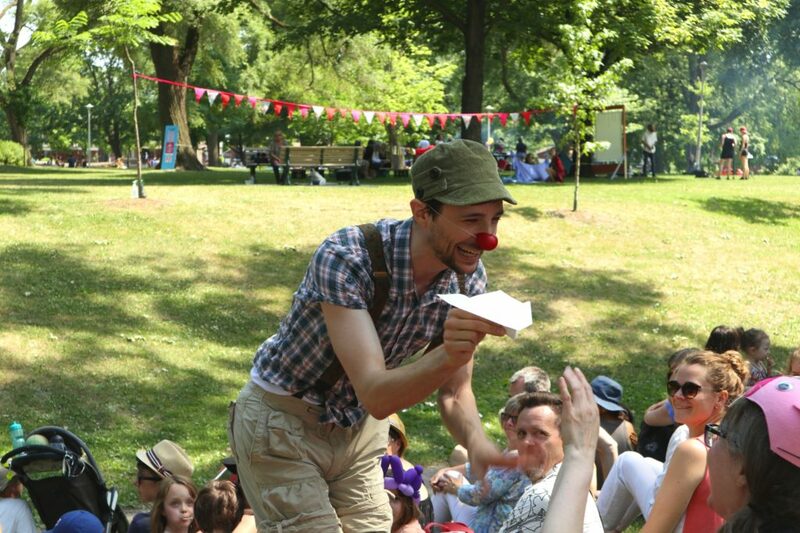 Clay & Paper Theatre performs exclusively in public spaces, such as Dufferin Grove Park. Not only is Clay & Paper working with Arts in the Parks to make better use of public space, but they are also engaging in acts of cultural transformation by reminding audience and community members of our common ground: “One of the reasons that we work in public space [is]… because we want to point to the earth that we’re standing on and make everyone aware of the very place that we come from” said Tamara. This kind of earthly connection is rooted in all of Clay & Paper’s work, which can inspire audience members to think and act in a more comprehensive, community-based way. 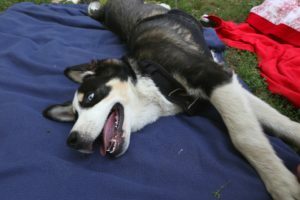 After enjoying the afternoon in Dufferin Grove Park with Clay & Paper Theatre, I left the Day of Delight in high spirits. 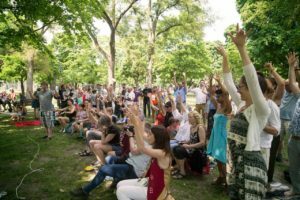 Between the beautiful warm weather and the full animated crowds, it was easy to see why an initiative like Arts in the Parks has become so well-loved by communities throughout Toronto, and how art, like the theatrical art from Clay & Paper Theatre, can unite communities, encourage important discussions and actions, and ultimately change the world for the better. next post: Kicking off summer with a bang (on the Taiko)!